I've been finding in my life that God delights in working through the non-ordinary. I've also been realizing that He has little lessons prepared for me in literally EVERY area of my life, if I just am in tune with Him and watching for them. Last December, He taught me a very powerful lesson through a bell sleeve pattern, of all things. I started this post in February and here it is now, just a little while later. =) I feel like for some reason, this timing of posting this now is perfect, and that there is someone out there reading this that needs this truth in their lives today. TAKE HEART that God has got your life in His hands. This truth impacted my perspective in such a huge way, that it is my HOPE that it can do the same for yours. It doesn't matter how big or small your trial is, or how unique to you-I want you to know that GOD CARES and that He has a bigger picture in mind. At the time of this particular sewing project, I was going through the greatest struggle of my twenty-four years of life. I was dealing with major trust issues (both with God + with several people in my life) and I literally felt like things were spiraling out of control. It was one of the first times in my life that I felt I was deeply invested with a situation, deeply affected by the results, and yet completely and totally out of control with the entire thing. I needed this lesson. Jesus in His grace knew that and sent me this truth at the perfect time, to strengthen my faith and remind me that He cared more than anyone else could. Here I was again, with little time to spare and no extra time for something to go wrong. I was combining and tweaking patterns which required extra time and major extra mental capacities which I felt were seriously lacking. But when it came to this sleeve I determined to follow instructions. I knew better (from past failures) than to attempt to throw a sleeve together without a concise plan in mind. I've sewn sleeves before. Many times. The first time I tried making up my own pattern and cutting out the fabric how I thought a sleeve should look. Needless to say I learned my lesson. And since, even though I love veering from the patterns and combining ideas and coming up with my own, I always (and I mean ALWAYS) make sure to *mostly* stick to whatever sleeve pattern I am using. No more cutting out my own ideas. The pattern makers know best in the sleeve arena! I've always been infatuated with bell sleeves. They're just so awesome-I love the flow of the extra fabric and the regal feeling I always get when I'm wearing a top or dress with sleeves like this. I was very excited about this pattern and sewing these dresses for several reasons, one of which was that I was combining multiple patterns (and that always excites me because then its kinda original with me!) but also because I had only sewn short sleeve and sleeveless styles before, and hadn't previously done long sleeves. I laid the sleeve pattern out and began to cut. It looked crazy for sure but being a seamstress who has sewn a lot, I have learned by now that sleeves, more than any other part of a sewing project, look totally not like a sleeve when they are first cut out! It doesn't matter if its a cap sleeve, or half sleeve, or long sleeve...the pattern piece (before sewing) just doesn't resemble a sleeve at all. I was pinning along (see above picture) and had just finished cutting out the first bell sleeve, when my youngest sister Rebecca walked through the room. She came over to observe my progress and asked, naturally, "So what part is that supposed to be?" Me: "Its the sleeve, Rebs!" I smiled at the thought of her giving me sewing advice. =) As I opened my mouth to answer her, it was like Jesus gave me this lesson on the spot. I began to explain: "Yes, it's a sleeve, honey! I know it doesn't look like it now, but its gonna be the most beautiful sleeve you can imagine, and when it's all finished, it won't look anything like what you are looking at now. See, a sleeve doesn't start out looking like a sleeve. In order to get that beautiful bell shape, I have to cut out something that looks very different. I have to follow the pattern. If I follow that pattern, this sleeve will turn out looking just like what its supposed to look like, and it will fit me perfectly. But I have to stick to the pattern for that to happen. So even though it looks really strange right now, I know for SURE that it will look like a perfect sleeve if I just keep going with the pattern. And you know something, Rebecca? Life is the very same way. Often what Jesus tells us to do doesn't make sense. We think 'this isn't what I had in mind! This isn't what my life is supposed to look like!' There are going to be times when this will happen to you. But don't worry about how things look at the time. You can know, beyond a shadow of a doubt, that JESUS made the pattern (His Word) and listening to it and His still small voice will get you successfully through whatever you might go through! The circumstances and results will very well look completely opposite to what you were wanting. But trust the Designer-He put the time and thought into this pattern (your life) and He has a beautiful sleeve (story) just waiting at the end, if you will just trust and obey, no matter what!" Does the pattern always make sense? Ha, NO. Not in the slightest. So why do I still choose to follow it? Because I have seen the picture on the cover of the pattern, and I know that that picture's costume was sewn directly by following the instructions of the pattern. I know that no matter how "unlike" it my current piece of fabric may look, the maker of the pattern knew what they were doing and had a very definite plan in mind. And I KNOW that if I follow that plan, I will get a sleeve exactly like the one on the cover of the pattern. Why do I still choose to follow God's Word and listen to His voice even when it looks like everything is falling apart and there is no possible good ending? Because I have seen His Word. I have seen it change lives. I have seen it change my life. I know that it is real and alive and LIVING. I know that Jesus is real. I have heard His voice. He gave me pattern instructions and even though it went against everything that I felt like doing...obeying that "pattern" of His voice is always the greatest decision I could make. No, I might not understand. I very well might feel like making up my own and not following His. And I might not even get the chance to see the fully "finished product" of that circumstance, for years to come. But following it will always yield the sweetest results, in the end. From my heart to yours, I am praying that Jesus would use this to touch whatever heart or hearts are needing this reminder today-that although your trial looks like a sleeve pattern to you, and you think "how in the WORLD could anything positive and beautiful come from this distorted shape? 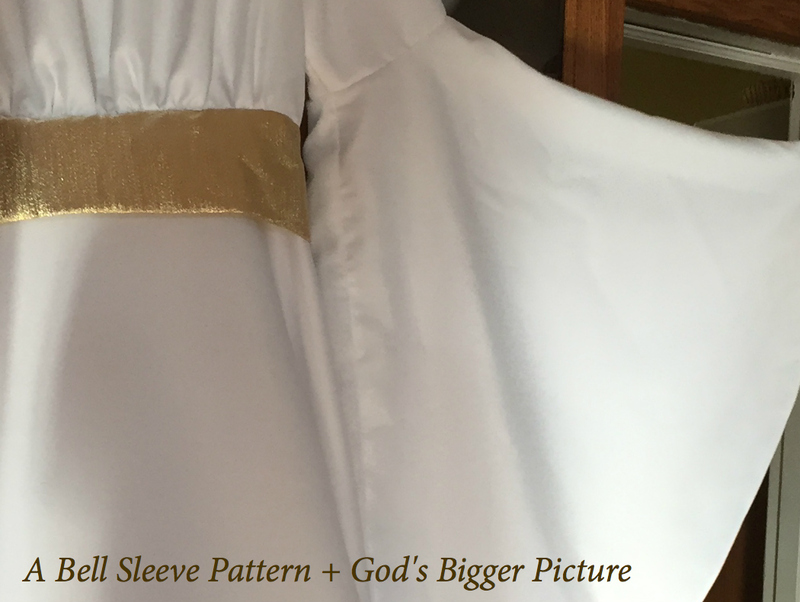 "yet Jesus looks at your "sleeve pattern" story from a heavenly perspective. He sees the beautiful picture of what can be, what will be, if you continue to follow the pattern. He knows that the final product will look beautiful, and intricate, and amazing, if you are faithful to follow HIS design. Don't take that scissors and cut out what YOU think looks like a bell sleeve. Just keep following that pattern. Don't stray from it. The person who created that original sleeve pattern? They knew what they were doing. They measured + analyzed + planned out that bell sleeve pattern, right down to the smallest measurements. Everything was prepared for a beautifully finished product, IF the pattern will be followed. yet believing, ye rejoice with joy unspeakable and full of glory." This is the story of life. Stay strong. Keep going even when you don't understand. Don't veer from God's pattern. His instructions are the best every time. Sis, this is beautiful. SO beautiful. I love seeing you follow the pattern in your life, and the beautiful things God is making because you followed even when it didn't make any sense. He is so good, SO good. And thank you for speaking this story/phenomenal truth into me and everyone else who will read this. This is a beautiful post, dearie. It blessed me so much. How grateful I am for your willingness to share your heart and encourage others by your life. You are a beautiful soul! Hugs! Chels, I have to echo Allison and say that this is beautiful. God is so good. Thank you for posting this! I wanted to comment with this verse, I really feel like it goes with this post. Isaiah 41:10 "Fear thou not, for I am with thee: be not dismayed, for I am thy God: I will strengthen thee, yea, I will help thee, yea, I will uphold thee with the right hand of my righteousness." I think this is the best post I've ever read from you, Chelsy. Seriously. Well done. Your message was God inspired. On a side note, I can hear Rebecca saying something like that too. That part made me smile. A great lesson and a beautiful outfit! So true Chels! Thanks so much for the needed reminder and encouragement! Beautifully said, friend! Thank you for this important reminder! c) That last picture! The light! And the sleeves turned out simply dreamy, oh my. Love you + your passion for truth!! Thank you so much for this, Chels...such an encouragement! Yes, you are ABSOLUTELY right that God delayed the timing of this post from February until now to meet the specific and timely needs of others. For the better part of two years now I have been dealing with arguably the most difficult struggle I've encountered in my 24 years of life, and a huge part of the issue has been even retaining the DESIRE to follow God's "pattern" in this particular situation. I reached a point -- and remained there for a long time -- where, like you mentioned, I struggled to believe that a positive outcome in this circumstance was even possible. Finding the grace to have enough faith to believe God's promise in Romans 8 -- that He works all things together for good to those who love Him, even when I can't picture how that could possibly happen -- was a long, slow climb up a very steep hill. To the glory of God I can finally say that steady progress up and out of this dark pit has begun. The struggle continues, but by God's grace I am no longer in the dark place I was for so long...and still was just a few short months ago. I am human and sometimes slide back a bit, but God has been faithful and provides grace to the humble. And even though I may not get to see how He uses this situation for a positive outcome in the other person's life, I'm beginning to see a hazy outline of the positive ways He's using this situation to change me. I fervently pray that God will somehow use this difficult situation for the eternal benefit of the other person's soul, and I have found grace to believe in that possibility, even if the temporary picture is pretty painful and doesn't remotely resemble anything beautiful, like your bell sleeve. Anyhow, to my shame I have to admit that back in February, my heart was not prepared to fully receive the message of this post and allow God to use it to support lasting change in my perspective and desire -- which in this, as in many difficult situations, are really the only things I can change. Your analogy has imprinted a beautiful picture in my mind and will stay with me when I am again tempted to wonder why God allowed this mess to begin in the first place and to wonder whether anything good can possibly come out of it. So thank you so much for allowing God to move in your heart to share this post. Blessings! Thank you so much, Chels!! I needed this right now! Thank you, Chelsy, for your encouraging post. Thank you for letting God use you to encourage others! Thank you for following His pattern (and the sleeve too!!) Love to all the Bdontragers! (btw, when I sign up to receive your post via email, it says I'm already signed up, but I'm not getting them) Not sure why?? I apologize for this! Not sure what is the problem...but I am quite sure that the issue is somehow connected to the switch in domain names awhile ago. 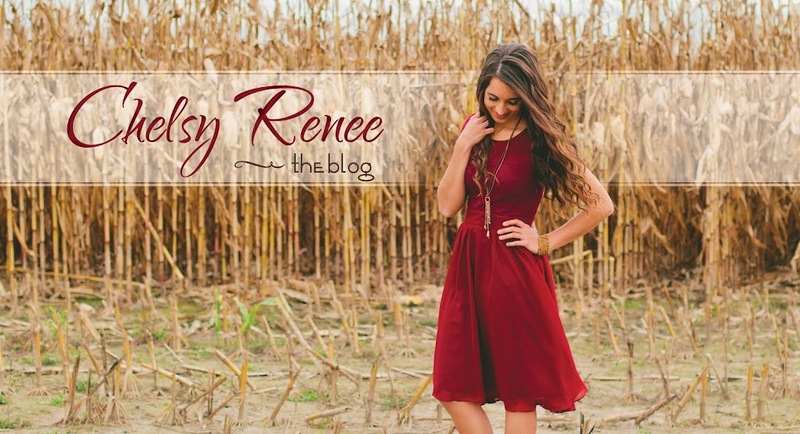 (this used to be www.chelsyrenee.com, and now its back to a blogspot) Thanks for alerting me to this and I will see what I can do to remedy the problem!